We’d like to share our own version of a St. Christopher Columbus story with you! While Old Glory Ranch’s main focus is hosting amazing weddings and corporate events here in the beautiful Texas Hill Country, Suzanne McCord, owner of the ranch, also raises and sells miniature donkeys. These adorable creatures have become quite popular and are often seen at events wearing brightly decorated wicker baskets and serving as “beer burros”! A new addition arrived on Old Glory Ranch in the form of a miniature donkey who has been named St. Christopher Columbus [born the day after Columbus Day 2014]. His mother had a stillbirth in May of 2014 leaving us to believe she was no longer pregnant as a twin birth is uncommon with miniature donkeys. So we were a bit surprised when she gave birth in October to little Christopher. He was a pretty tiny little guy and was rejected by his mother right away. More than likely because of ‘animal instinct’ feeling that he wasn’t the healthiest of babies. In order to keep him safe, we stepped in. Baby Christopher taking a bottle. We tried surrogate mother miniature donkey’s who also rejected him leaving only one option to give the little guy the fighting chance he deserved. Thus, Christopher became a ‘bottle baby’ and had lots of surrogate ‘Mothers’ in the form of Old Glory Ranch family and staff members who fed him around the clock for many weeks. He has delighted us with warm nuzzle greetings as we entered his pen to feed and stolen a bit of each of our hearts. If he could crawl in your lap, he would [he even tries!]! While his beginning proved to be a tough struggle that included a couple bouts of pneumonia, and other infections which required antibiotic injections several times a day, we felt he was pretty much out of the woods as he neared his 2 month birthday. We had been told by our vet that he will probably be very small even as an adult. For the first few visits to the vet he rode in the Old Glory Ranch manager’s pickup, not the trailer, but in the back seat of the truck like the ranch dog! Surrogate Mothers came in all sizes! Katie takes a turn feeding Christopher. Suzanne often refers to him as the ‘million dollar donkey’, saying he will more than likely be a permanent fixture here. One day he will earn his keep by becoming one of our working donkey’s where clients and guests of weddings and events can get to know him as well. He continues to follow us around more like a puppy than a donkey. He likes to frolic and play with the other baby donkey who is younger than him, yet nearly twice his size! When this piece was initially started, Christopher gave us an additional scare with yet another infection, so rather than having a sad ending to his story, we wanted to give him plenty of time to become what is ‘normal’ for him before finishing the first chapter of his story. He has proven to be quite a fighter and bounced back from that infection and celebrated his 4 month birthday earlier this week! 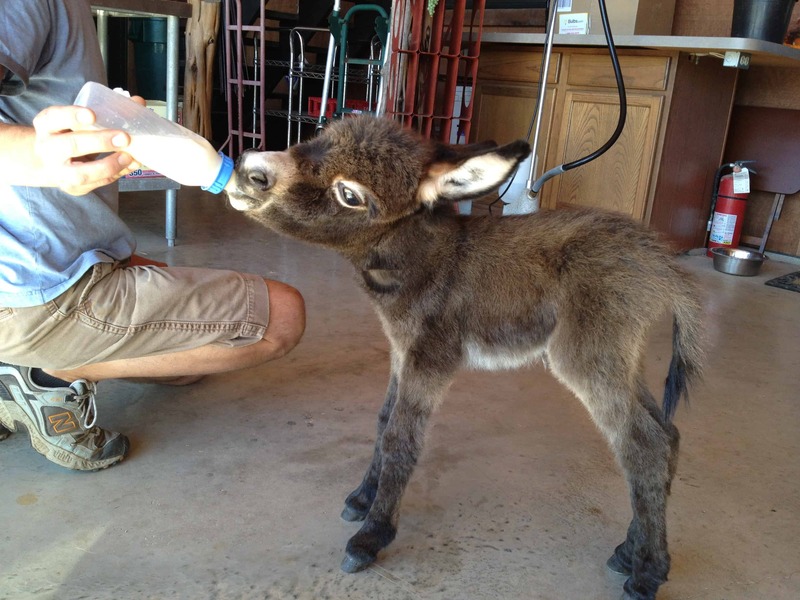 Today [2/13/14] he will be completely weaned from the bottle and will continue to frolic and play with his donkey, canine, and human friends. He’s really quite the celebrity even greeted one of the UPS drivers this week who was a bit surprised at the sight! We think he could be the first of his kind, a ‘dogkey’! See more photos of our adorable miniature donkeys. Join us for an Open House! Once an OGR alum, you’re part of the family!